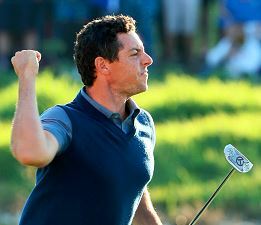 After losing all four matches in Friday morning foursomes, the European team came roaring back to win three of four in the Friday afternoon fourball matches. Only the most optimistic of US fans could have believed that they would continue their morning success. I thought that a 2-2 split in the afternoon could be considered a US triumph. If I was DL3, I would order the fairways and greens watered overnight in an attempt to replicate the softer conditions of Friday morning that the US team seemed to like. Below are the pairings and tee times for Saturday Morning foursome matches.